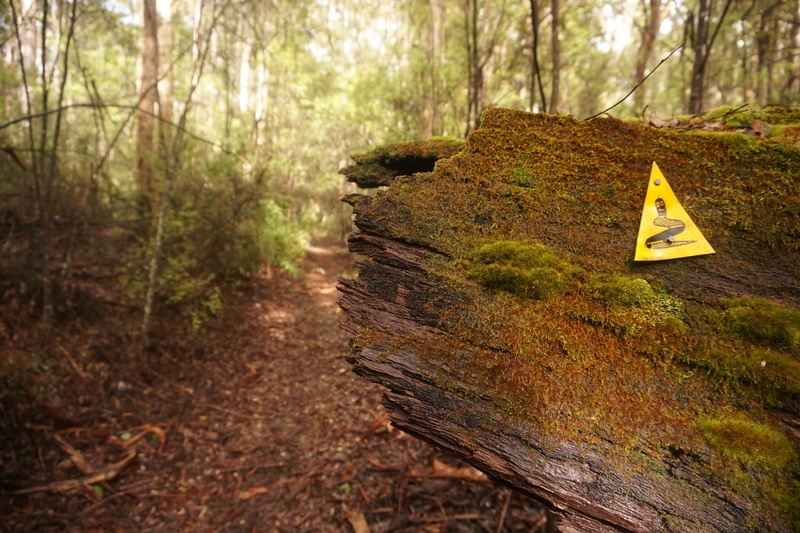 Day two of a two-day hike from Southampton Bridge, near Balingup, to Donnelly River Village. There are few better feelings that being warm and dry in a sturdy tent while the rain buckets down on top of it. 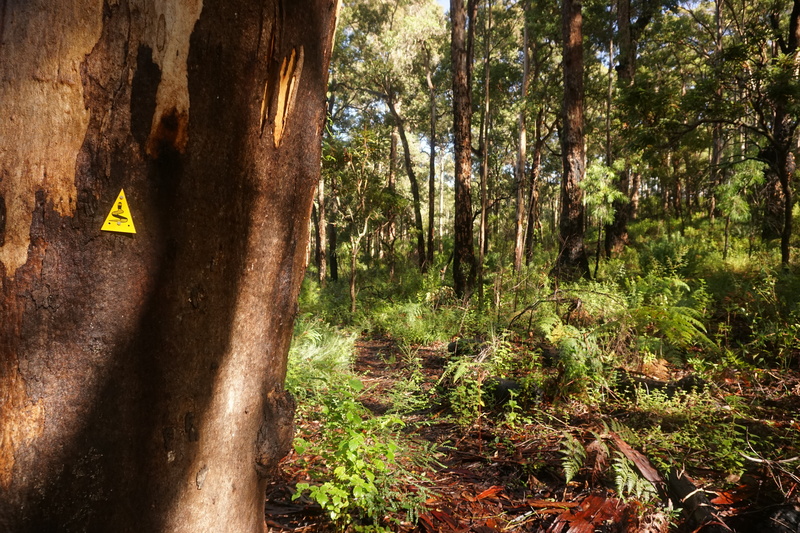 The sound of the rain and swaying leaves lulled me to sleep at Gregory Brook, but I woke up the next morning to thin rays of sunshine piercing through the tree canopy. I eventually mustered the courage to crawl out of my warm sleeping bag, and joined my hiking friends Bonny, Pete and Fahad for breakfast in the wooden shelter. 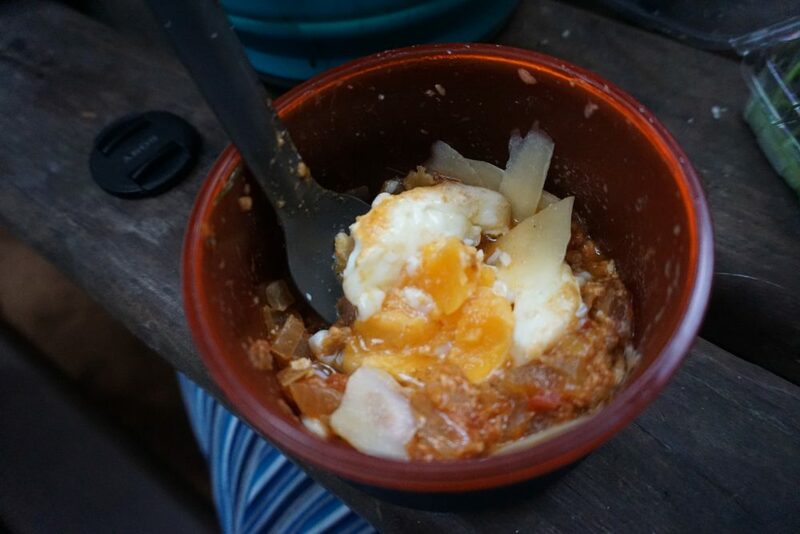 Fahad was on breakfast duty, and was in the middle of preparing some delicious shakshouka (basically eggs in spicy tomato sauce) by the time I arrived. We chowed down and sipped our morning coffees, enjoying the glistening stillness of the bush after a night of heavy rain. I took some time out to snap some photos of the campsite and the brook before we packed up camp. 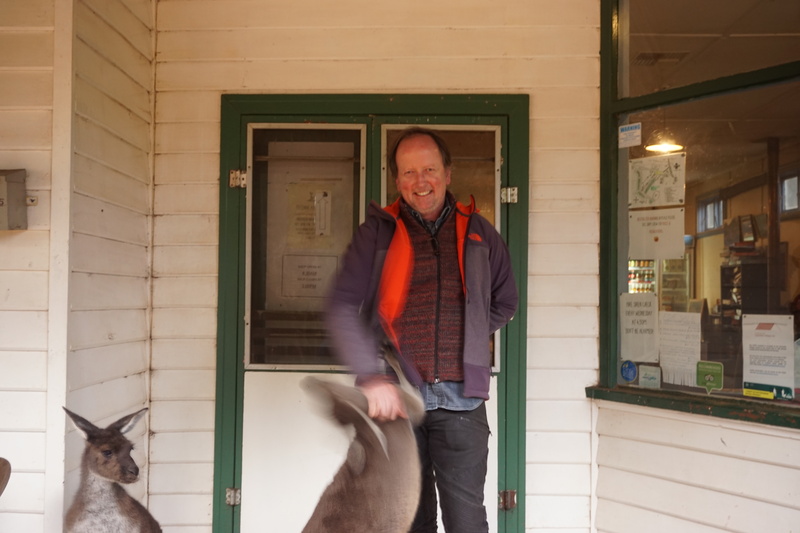 We headed off later than planned, but not before we met Pack Animal (aka Dave), a legendary Bibbulmun hiker who’d left Donnelly River Village very early that morning to avoid the afternoon’s forecast storms. Pack Animal is easily the most prolific hiker of the Bibbulmun, and he’s clocked up more end-to-ends than is worth counting. His name appears dozens of times in every single logbook, always with the same annotation: “All good, nice sunny day”. We hadn’t been as careful in our planning as he had, and were dreading being caught in a major downpour. So, after a short chat, we hit the track. 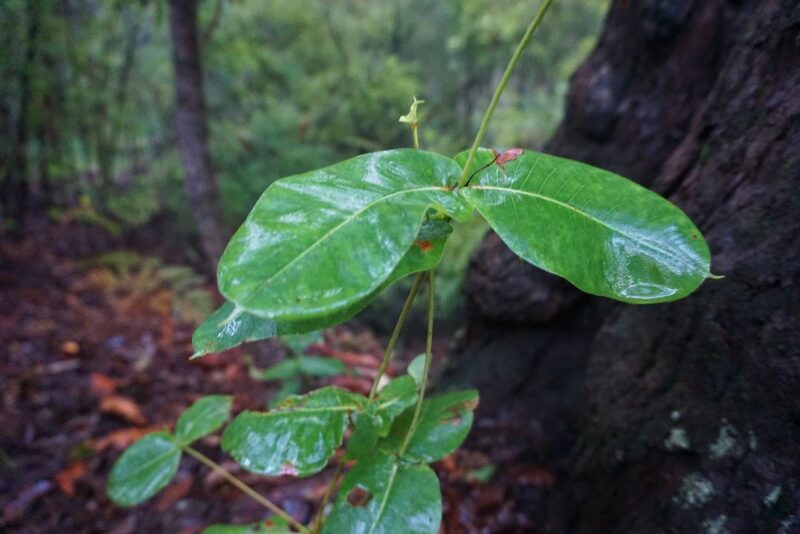 The bush was green and wet, and alive with rivulets of runoff that occasionally crossed the track. Raindrops still clung to leaves and gleamed in the sunlight, and the occasional gust of wind would shake them off the soaring tree canopies and onto our heads. Thankfully, it was sunny and dried off quickly. After about an hour of mostly pleasant walking on foot trail and 4WD tracks in the sunshine, we made it to the Karri Gully picnic area on the Brockman Highway, and stopped for a group photo. 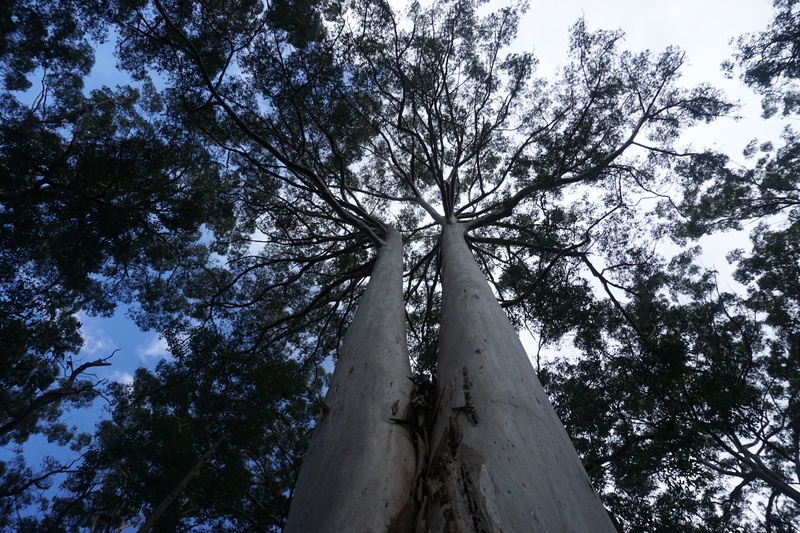 Karri Gully is one of the first sightings of the track’s towering karri trees for southbound hikers, and it was good to see them again after a series of somewhat unspectacular hikes further north on my quest to finish my end-to-end. 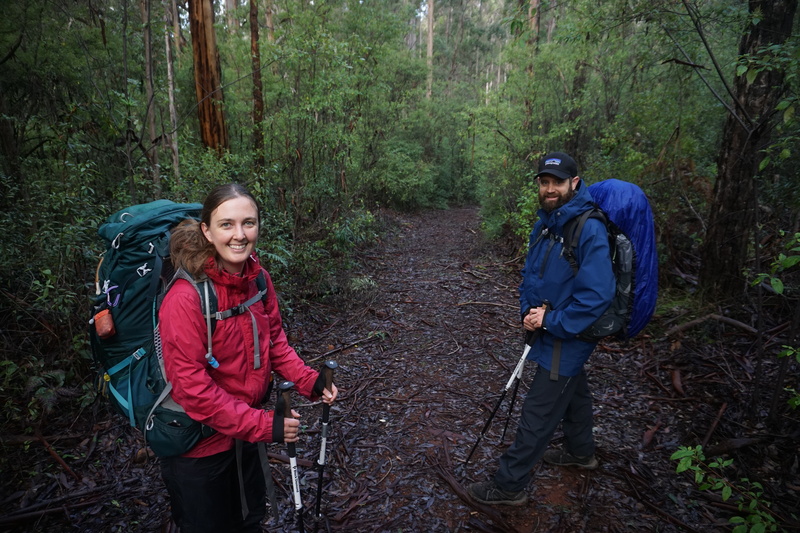 After leaving the gully, we followed the track along the north side of the highway for about a kilometre before following it across the road and descending into the bush. The track got wetter and more inundated as we dipped closer to the maze of tributaries that feed the Donnelly River. 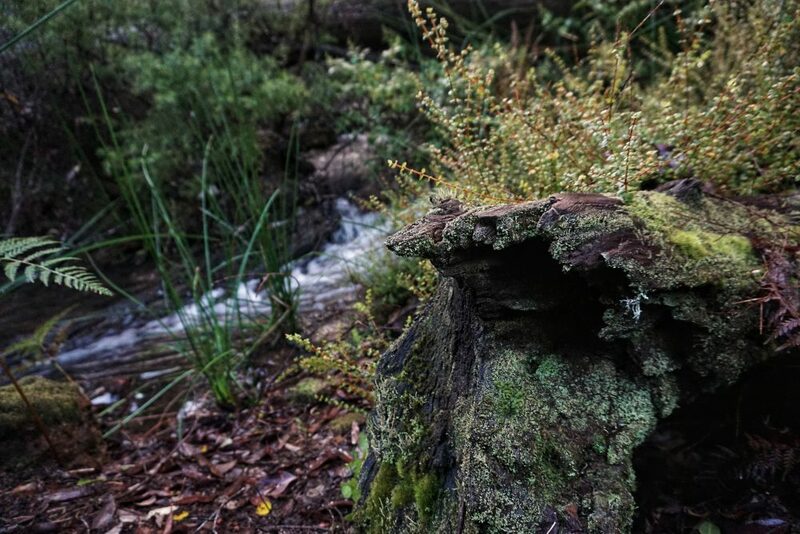 Before long, we reached the first of a series of moss-covered wooden footbridges over a fast-moving stream. The light was perfect, so I went scrambling in the bush to get just the right angle for a photo. The sky got darker as we approached Willow Springs campground, our planned lunch spot, and short bursts of rain pelted us. We arrived at the campground in the middle of a particularly fierce squall, and considered pushing on until the weather improved, but it quickly abated and we were able to enjoy a hurried lunch at one of the picnic tables. The intermittent showers continued after lunch, eventually forcing me to stow my camera in a dry bag. 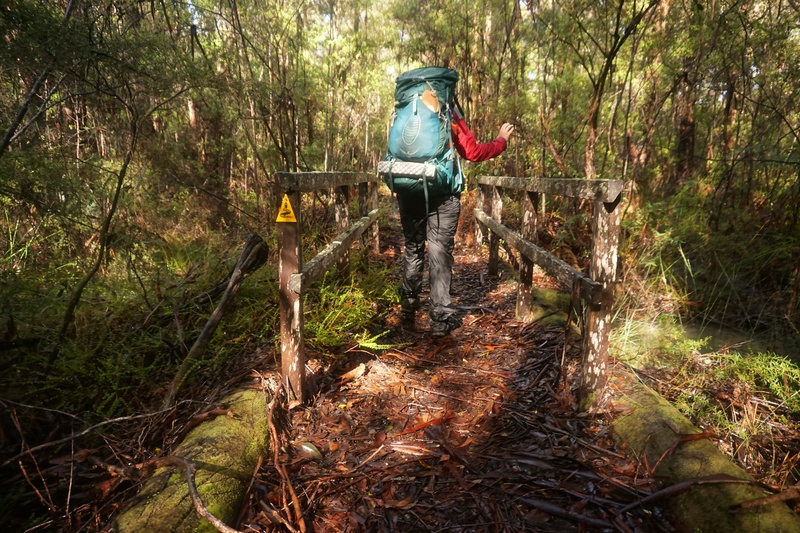 We trekked under more towering karris for a couple of hours, then reached a decommissioned road bridge that crosses the Donnelly River, which was still not flowing. 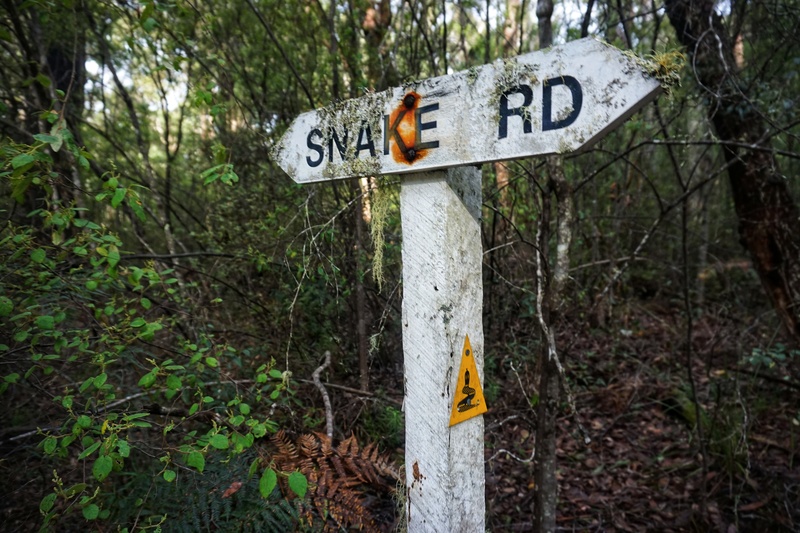 We turned onto Snake Road, another old 4WD track that leads all the way to Donnelly River Village. Luckily the showers eased, making for an enjoyable walk for our last six kilometres into “town”. We passed an abandoned campsite, climbed and descended a series of hills, then Snake Road spat us out into a grove of especially huge karris at the edge of the village. We took a break to take some photos, and listened to the amazing sound of the wind whipping through their towering canopies. I made it to the village store feeling a lot better than I had the last time I walked this section a year ago, when I was 20 kilos heavier and significantly less fit. I had vivid memories of limping into town with seized muscles and aching feet, but this time I was only a little tired, and in need of a stretch. 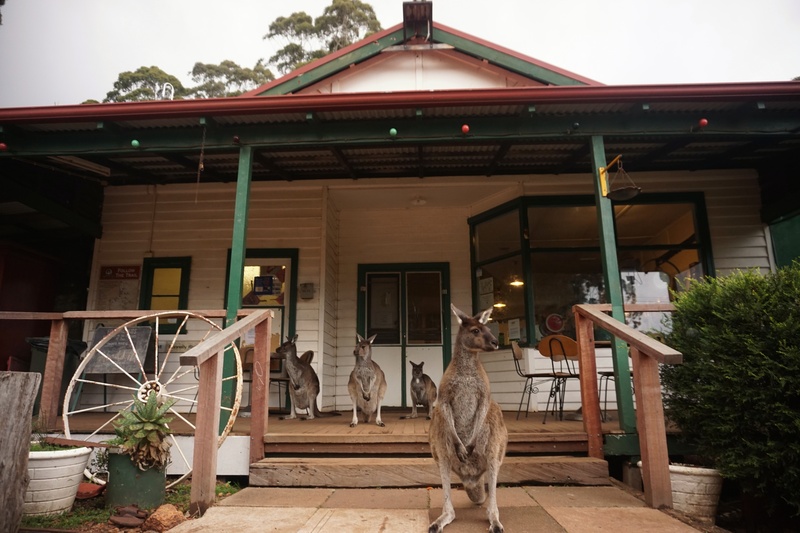 I found Fahad, who’d raced ahead, making friends with the tame kangaroos and emus that hang around outside the shop. I met the “mayor” of DRV, Andrew Sullivan, who is also a councillor at the City of Fremantle near my home in Perth. I ran around and got plenty of wildlife photos, before we loaded up my car and drove back to collect Pete’s car at Southampton Bridge. 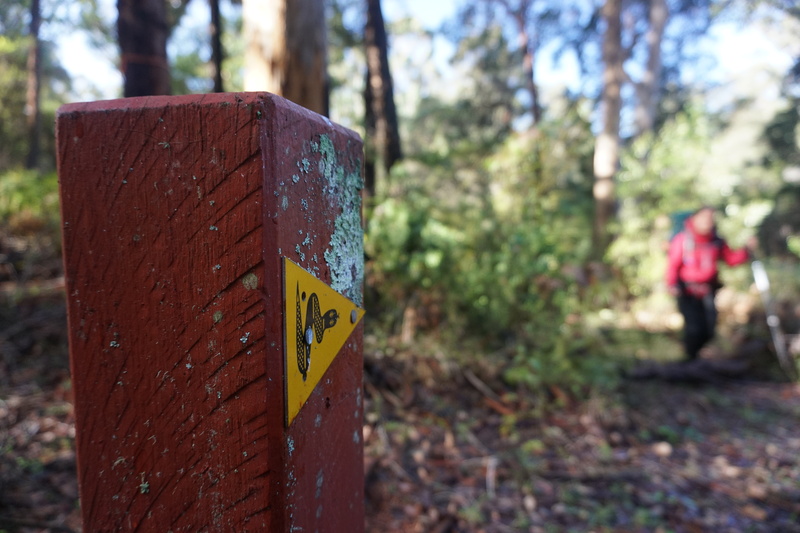 This two-day hike inspired me to re-do the sections around Balingup and Pemberton, but it will probably have to wait until after I do the Pacific Crest Trail next year. I’d thoroughly recommend the Southampton Bridge to DRV stretch to anyone looking for a weekend among the karris. 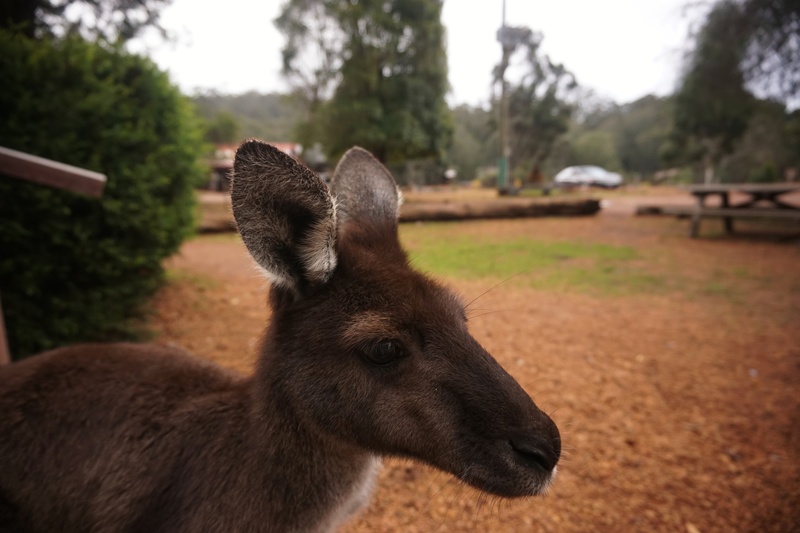 At about three hours drive from Perth, it’s doable on a regular weekend if you’re prepared to get up early enough. Unfortunately there are no transport links to DRV, so you’ll need to take two cars or make other arrangements.